Know when to replant your planters. Plants grown in planters over a long period of time will produce an expansive root system that exhaust the potting compost of nutrients. 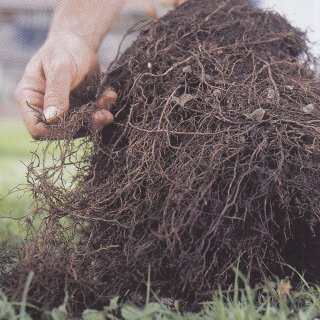 The roots also make it difficult for oxygen to penetrate the soil as they tend to choke up every pore of the soil. Regular re-potting supplies fresh nutrients, opens up the soil structure, and so promotes new root growth. Poor growth and yellowed leaves. 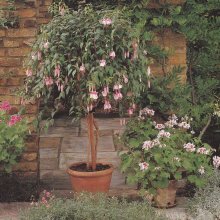 The plant wilts more quickly than well-potted specimens and needs constant watering. 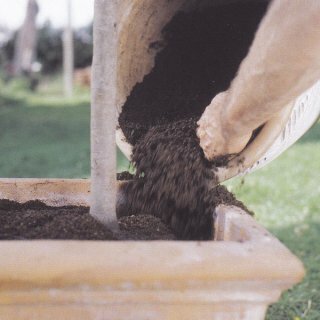 The surface of the potting compost is matted with a web of roots. Water runs out of the planters drainage hole too quickly. This means that the soil in the planter has become replaced by roots!The roots are growing out of the planters drainage holes. The entire plant is top-heavy. A good rule of thumb is that the distance across the top should be approximately half the height of the plant. you've removed them from the soil, so make the transition a speedy one for best results. The first step for re-potting is to prepare your plant's pot. The pot should be one size larger than its current planter, allowing an five centimetres or so for growth at the sides and bottom. Cover the drainage hole with clean rocks, a shard of terra cotta, a coffee filter, or a screen to keep the hole from becoming plugged. Fill the pot with a five centimetres of fresh plant medium. To get your plant out of the old planter, ease your trowel around the edge of the planter to loosen the soil. Tip the planter and guide the plant out. If the plant has become root-bound, or its roots are knotted at the bottom, gently break off the knot and loosen the roots with your fingers. Now you're ready to re-plant. You can mix dry fertilizer into the planting medium when you plant, but wait a few weeks before adding liquid fertilizer, to avoid risk of root burn. Once your plant is in its new planter, water it thoroughly. Do not water again until the soil is almost dry, to prevent any damaged roots from rotting. Large plants in big planters can be extremely heavy and often reluctant to come out of their planters. Tip the planter on its side so that you do not have to lift the weight of the compost and to get a better grip on the plant. A stubborn plant might need two people. one to hold the planter the other to pull out the plant. If the plant is stuck, give it a thorough watering to help release the roots grip on the side of the planter, or run a long-bladed knife around the inside of the planter to free up the root ball. Once the rootball is free tease out the roots from the potting compost and shake off most of the old soil. Loosen the root ball by rubbing the roots through your finger tips to separate out the matted strands. Use a strong jet of water from a hose to wash out the soil stuck between the roots. 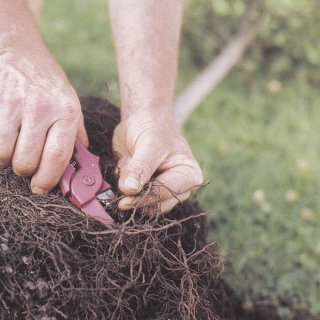 Up to one third of the roots can be cut off: Cut through a few of the thicker roots and remove whole sections. Keep the finer roots intact as these are useful to help re-establish the plant. The soil and grit around the roots will damage your secateur blades so use an old cheap pair. Replace the drainage material in the planters’ base and put a layer of potting compost on top. 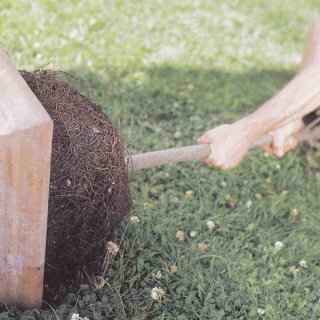 Position the pared-down root ball and fill in around it with fresh, dry compost. Push compost around the root ball and then shake the plant and planter to make sure that compost settles in any gaps. Do not firm down the compost. Water thoroughly, and keep the planting out of hot sunshine and drying winds for several weeks while the roots re-establish themselves.